← Is the New York Times Pimping Out Its Major Journalists? As the hardworking staff noted yesterday, the New York Times is increasingly turning its journalists into arm candy for revenue-enhancing commercial ventures, from Times Journey duty to high-powered busine$$ forums. Meanwhile, the Times has stripped its homepage of their bylines. 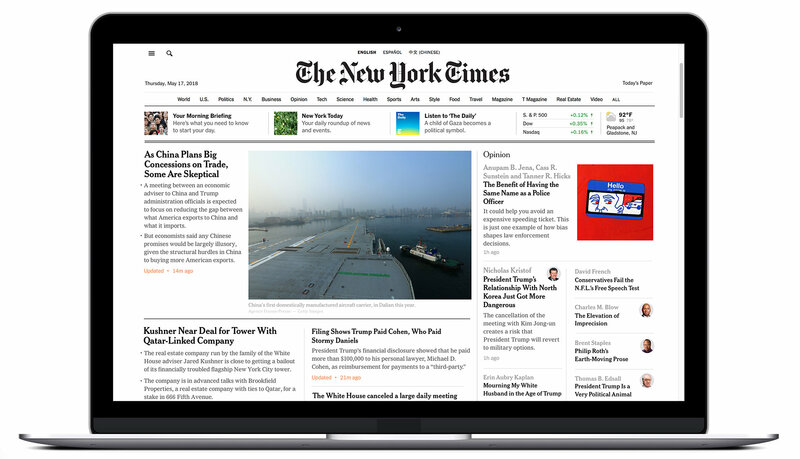 Our executive editor, Dean Baquet, and managing editor, Joe Kahn, explain our thinking regarding bylines on our home page. We have updated our home page with a new design, and scores of readers have written to us regarding the placement of bylines on the page . . . There will always be bylines on New York Times stories. We love to boast about our writers, their backgrounds and expertise, and the risks they take to deliver the news. In fact, we put our writers forward as never before. Of course it will. Because it’s all about mobile now. Then again, not everyone is interested in going mobile. From Michael Calderone’s Politico Morning Media. Anyone checking with the sisters? You’ll find some here. This entry was posted in Uncategorized and tagged Alexandra Bruell, Arthur O. Sulzberger Jr., Athens Democracy Forum, Dean Baquet, Elisabeth Bumiller, Joe Kahn, Maureen Dowd, Meredith Kopit Levien, Michael Calderone, New York Times, Nicholas Kristof, Op-It Girl, Paul Farhi, Politico Morning Media, Richard Deitsch, Scott Heller, Times Journeys, Wall Street Journal, Walter Shapiro, Washington Post, Wesley Lowery. Bookmark the permalink. I could care less about the Times not putting by-lines on their home page. It’s their page; they can do with it what they will. But then, they are going to have to accept full responsibility for whatever appears there rather than sharing the responsibility with the author. Personally, I have no problem with holding the Times itself responsible for anything that it prints. Fair enough, Mudge. The byline does appear on the story itself, so there’s that. But don’t you think regardless of all the byline mishegas, the Times has always been responsible for anything it prints?